The prime minister urged law enforcers to act tough on illegal takeovers. Prime Minister Volodymyr Groysman has urged the National Police and other law-enforcement agencies to act tough on illegal takeovers of companies and assets. "It is our common position with the interior minister […] There is only one recipe for those involved in forcible takeovers, violent seizure of other people's property: 'face down on the floor'," he said meaning an immediate severe response of law enforcers to attempts of illegal hostile takeovers. 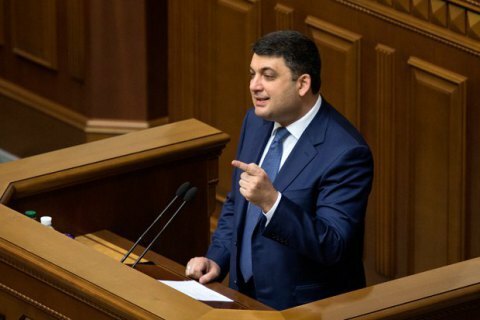 "I call on all law-enforcement agencies in the country, this is the position of the chief of the National Police and the interior minister: if anyone anywhere, in any corner of Ukraine, carries out a physical seizure of someone else's property, respond immediately, arrest and seek punishment," the prime minister said. In turn, Justice Minister Pavlo Petrenko said that his department is checking a public notary from Poltava Region, who is believed to be involved in the incident. "This parliament has adopted the law against corporate raiding, which provides for up to 10 years in prison for acts of this kind. I should say that this person stands a very good chance of getting to meet law-enforcement officers as a crime suspect," the minister said. On 5 November, police detained 40 persons involved in an attempt to forcibly seize an agricultural enterprise in Poltava Region.